0% Introductory APR on credit card purchases and balance transfers for the first 18 months from Account opening. After that, a variable APR of 13.99%, 17.99% or 23.99%, will apply. Make purchases the way you want -- mobile payment enabled supporting Android Pay™, Apple Pay™ and Samsung Pay™. Shop with confidence knowing that your purchases are covered with our valuable protection programs. Fraud coverage if your card is ever lost or stolen. Use online banking to access your account, even from your smartphone, with our mobile app. The HSBC Platinum Mastercard® credit cardHSBC Platinum Mastercard® credit card is a card that puts the focus on keeping things free and simple. If "free" is one of your favorite words, this card comes through with no annual fee and a 0 percent introductory offer on all purchases and balance transfers for the first 18 months. After that, a variable APR based on your credit worthiness applies. There are no foreign transactions fees when you use your card while traveling abroad, and the HSBC Platinum Mastercard® credit cardHSBC Platinum Mastercard® credit card offers up to $1 million in travel accident coverage and up to $50,000 rental car collision insurance for free, so feel free to pack this card for your next international trip. You can shop with confidence using HSBC Platinum Mastercard® credit cardHSBC Platinum Mastercard® credit card, as it offers both Purchase Assurance and Price Protection. For 90 days after you make a purchase, you are covered for up to $1,000 for accidental damage or theft. Better still, you will always get the best price on every purchase you make! If you happen to find the same item advertised for a lower price within 60 days of your purchase, your HSBC Platinum Mastercard® credit cardHSBC Platinum Mastercard® credit card's price protection program means you're eligible for a refund of the difference. Make purchases using mobile payment apps Android Pay™, Apple Pay™ and Samsung Pay™. Swift and comprehensive fraud protection, including credit bureau notification and card replacement. Free MasterAssist Travel Assistance Services, including pre-trip destination info, emergency medical and legal referrals (when traveling more than 50 miles from home) and lost luggage assistance. The HSBC Platinum Mastercard® offers an introductory rate of 0 percent for 18 months on all purchases and balance transfers. With no annual fee, there's no reason this can't be a card you keep in your wallet for a long time – a nice addition to your credit history. Protection. The HSBC Platinum Mastercard® offers a number of solid travel, fraud and purchase protections that you hope you'll never need, but will glad to have them if you do. The HSBC Platinum Mastercard® does not offer a rewards program to go along with its excellent intro APR offer. If you're looking for rewards, consider the HSBC Platinum Mastercard® with Rewards credit cardHSBC Platinum Mastercard® with Rewards credit card. Simplicity is a beautiful thing. 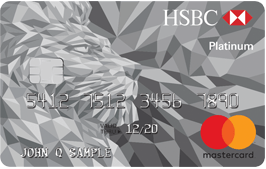 The HSBC Platinum Mastercard® credit cardHSBC Platinum Mastercard® credit card is a solid credit card that provides the convenience and reliability you need without the bells and whistles you might not require. The 0 percent introductory rate for 18 months on all purchases and balance transfers can be a major cash savings if you're not someone with money to burn, but who needs to make a big purchase and would appreciate an extra few months to pay it off. In addition, this makes the HSBC Platinum Mastercard® credit cardHSBC Platinum Mastercard® credit card an excellent card if you are working to emerge from a challenging economic period in your life. If you are taking advantage of the 18 months of no interest and making some new purchases, the HSBC Platinum Mastercard® credit cardHSBC Platinum Mastercard® credit card allows you to shop with complete confidence. The chip-and-pin default security, combined with comprehensive ID Theft Resolution Services, means you won't be left vulnerable to the consequences of fraud. In addition, the free Purchase Assurance program covers you for up to $1,000 for a full 90 days from the date of purchase if your item is stolen or accidentally damaged. If you are a fan of cash back or other rewards programs, the HSBC Platinum Mastercard® credit cardHSBC Platinum Mastercard® credit card isn't the card for you, as it offers no rewards program; however, you could pair it with the HSBC Platinum Mastercard® credit cardHSBC Platinum Mastercard® credit card, which does offer a rewards program (Check out our full review of the HSBC Platinum Mastercard® with Rewards credit card). As with other credit cards, you want to make sure you pay your bill on time, particularly if your plan is to take advantage of that introductory zero interest period. If you miss a payment, there are late fee penalties and you could forfeit your zero interest offer. This isn't an uncommon or unusual situation, but something you should keep in mind. An additional fee to think about is the balance transfer fee of $10 or 4 percent (whichever is greater). Both cards offer an introductory rate of 0 percent on balance transfers and purchases for 18 months. The interest rate after the introductory period jumps to 17.74%-27.24% Variable for the Wells Fargo Platinum Visa card, while it increases to 13.99%, 17.99% or 23.99% variable for the HSBC Platinum Mastercard®. Neither card charges an annual fee, but the Wells Fargo Platinum Visa card charges 3 percent on each transaction made while abroad. The Wells Fargo Platinum Visa card monitors your spending and purchases and lets you know about any suspicious activity with text and email notifications; it also provides easy access to your FICO® Credit Score with Wells Fargo Online®. The HSBC Platinum Mastercard® also monitors activity and provides notification but also provides additional assistance, such as credit bureau notification, if fraud is confirmed. The HSBC Platinum Mastercard® offers Purchase Assurance and Price Assurance programs that Wells Fargo Platinum Visa card does not. Both cards offer a 0 percent introductory rate on balance transfers for 18 months, however, the HSBC Platinum Mastercard® credit card extends that same offer to purchases as well. After 18 months, regular APR rates apply. Don't be so quick to rule the Citi® Double Cash Card - 18 month BT offer out though. As we mentioned earlier, the HSBC Platinum Mastercard® credit card does not have a rewards program. The Citi card, however, does. You can earn cash back twice on every purchase with 1 percent back when you buy, and then 1 percent cash back as you pay for those purchases (whether you pay your balance in full or over time). There's another fun feature with the Citi card: its new Citi Price Rewind program. Buy your stuff, and while you enjoy whatever you have purchased, Citi searches for a lower price than the one you paid. If the same item is found at retailers' sites within 60 days at a lower cost, you can get the price difference up to $300 per item, up to $1,200 per year. Neither card charges an annual fee, and the HSBC card has no foreign transaction fees, however, the Citi® Double Cash Card - 18 month BT offer does: 3% on each international transaction made. Citi does better with the balance transfer fee, though. It has a 3 percent charge or $5, whichever is greater; HSBC charges 4 percent or $10, also whichever is greater. These are both annual-fee-free cards, but Chase Freedom Unlimited® offers a flat 3% back on the first $20,000 new cardholders spend during the first year and then an ongoing 1.5 percent cash back rewards opportunity on all purchases. But Chase Freedom Unlimited®'s introductory 0 percent interest period is shorter. HSBC Platinum Mastercard® offers 0 percent APR on balance transfers and purchases for the first 18 months. ; whereas, Chase Freedom Unlimited® makes the same offer but for just 15 months (then, 17.24% - 25.99% variable). The balance transfer fees for the cards differ, too. The HSBC Platinum Mastercard® charges a fee of $10 or 4 percent, whichever is greater. Chase Freedom Unlimited® charges a fee of either $5 or 3% of the amount of each transfer, whichever is greater. Chase Freedom Unlimited® also charges a 3 percent fee for foreign transactions, so if you want to use a card while abroad the HSBC Platinum Mastercard® is likely a better option. Who Should Get the HSBC Platinum Mastercard®? The HSBC Platinum Mastercard® credit cardHSBC Platinum Mastercard® credit card is an excellent choice for people who like security in their credit card purchases and like to keep things simple. Not only are your purchases and your identity protected but the Price Assurance service guarantees you are always getting the best deal. Furthermore, if a lengthy zero-interest period piques your interest, this card is a solid choice. Transferring an outstanding balance with a high interest rate to HSBC Platinum Mastercard® credit cardHSBC Platinum Mastercard® credit card and enjoying 0 percent interest for 18 months can ease the financial burden greatly.